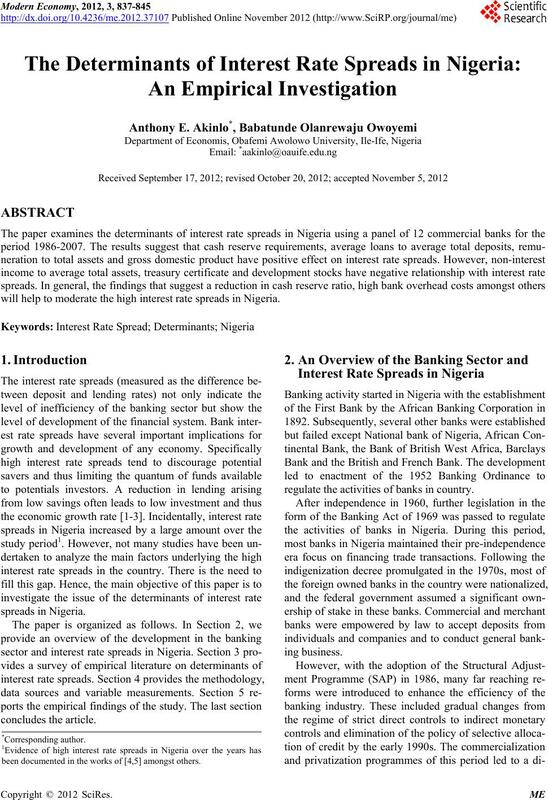 will help to moderate the high interest rate spreads in Nigeria. regulate the activities of banks in country. been documented in the works of [4,5] amongst others. folio restrictions. It rose to 8.2 and 8.9 in 1989 and 1990.
credit based on foreign exchange deposits was banned. Figure 1. Plot of interest rate spreads 1986-2007. 1990’s (Argentina, Bolivia, Colombia, Chile and Peru). cients were not statistically significant. and sectoral compositions of loans. banks’ interest rate spreads during the period. cient channeling of savings to productive investments. tently high interest rate spreads and margins in Uganda. had significant impact on interest rate spreads in Uganda. namely, pooled OLS, fixed-effects and random effects. slope coefficients are constant across banks. published by the Central Bank of Nigeria (CBN). bank’s total demand deposit liabilities. asset ratio or capital adequacy. This refers to the size of a bank’s loan asset. fers to bank’s personnel cost. to financially sound deposit money banks. draws inferences from the difference between them. stocks (DS), treasury bonds (TB) and treasury certificates (TC). tionship with interest rate spreads5. we estimate unit root test for each variable in the model. MRR, DS and CINFLAT were stationary at level. increasing the lending rate or reducing the deposit rate. lead to 0.82 percent reduction in the interest spreads. better results. Therefore, we only report the fixed effects model here. 20 percent in the fixed effect model. 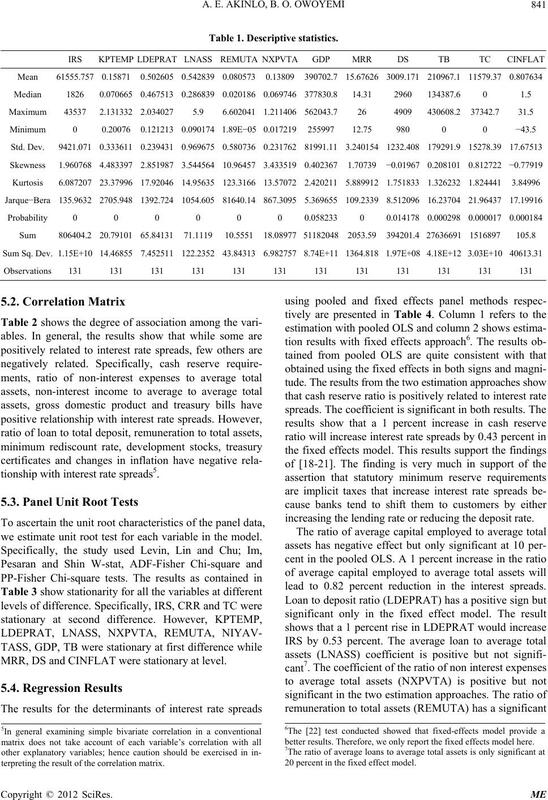 terpreting the result of the correlation matrix. Table 3. 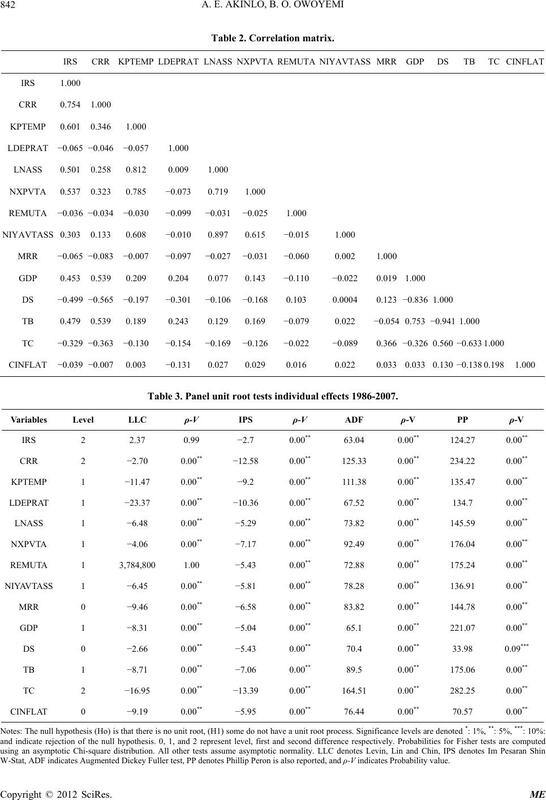 Panel unit root tests individual effects 1986-2007. W-Stat, ADF indicates Augmented Dickey Fuller test, PP denotes Phillip Peron is also reported, and ρ-V indicates Probability value. Table 4. 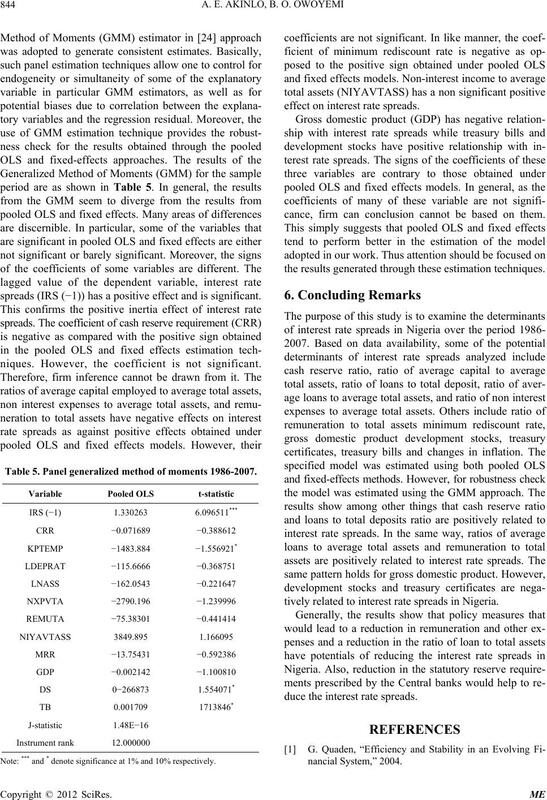 Pooled OLS and fixed effects 1986-2007. Note: ***, ** and * denote significance at 1%, 5% and 10% respectively. cause interest rate spreads to increase by 0.0000243%. rediscount rate (MRR) is positive but not significant. will reduce interest rate spreads by 0.000025 percent. tion of the exogeneity of the explanatory variables. rate, and this raises the spread. 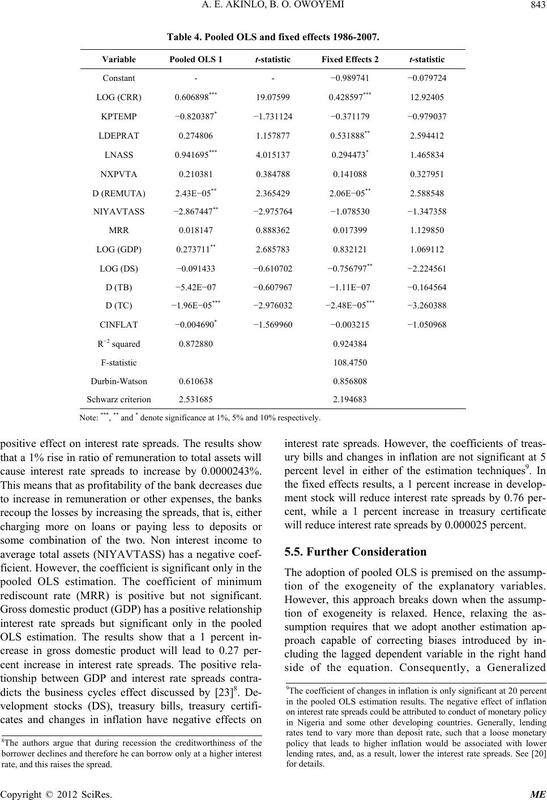 spreads (IRS (−1)) has a positive effect and is significant. niques. However, the coefficient is not significant. Table 5. Panel generalized method of moments 1986-2007. Note: *** and * denote significance at 1% and 10% respectively. effect on interest rate spreads. cance, firm can conclusion cannot be based on them. the results generated through these estimation techniques. 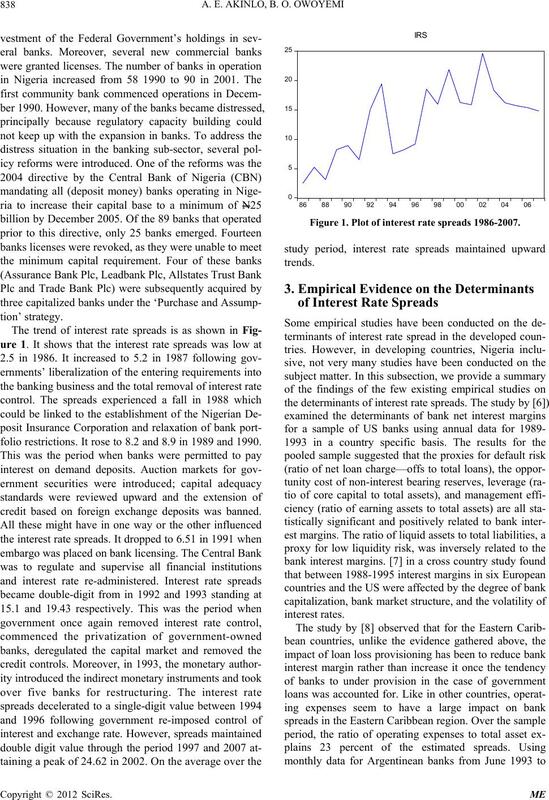 tively related to interest rate spreads in Nigeria. duce the interest rate spreads. Research and Analysis (KIPPRA), Discussion Paper No. Annual Conference of Nigerian Economic Society, 2005. Financial Review, Vol. 41, No. 1, 2003. 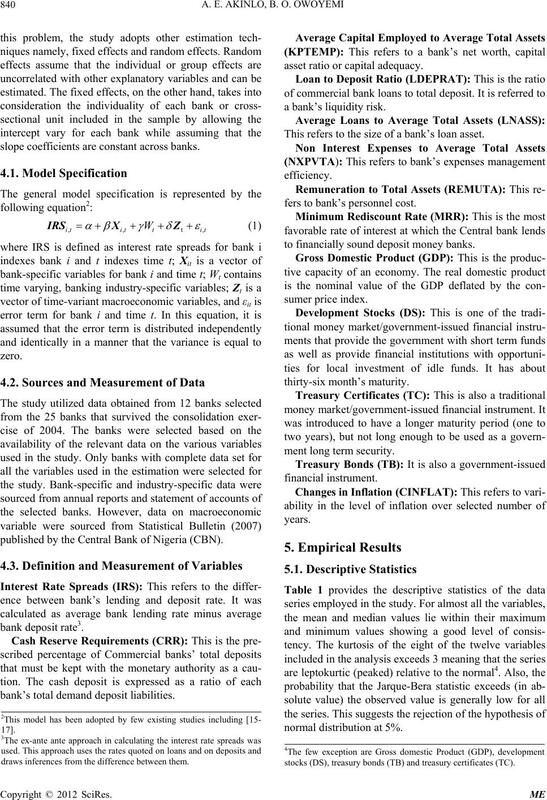 Banking,” Journal of banking and Finance, Vol. 21, No. 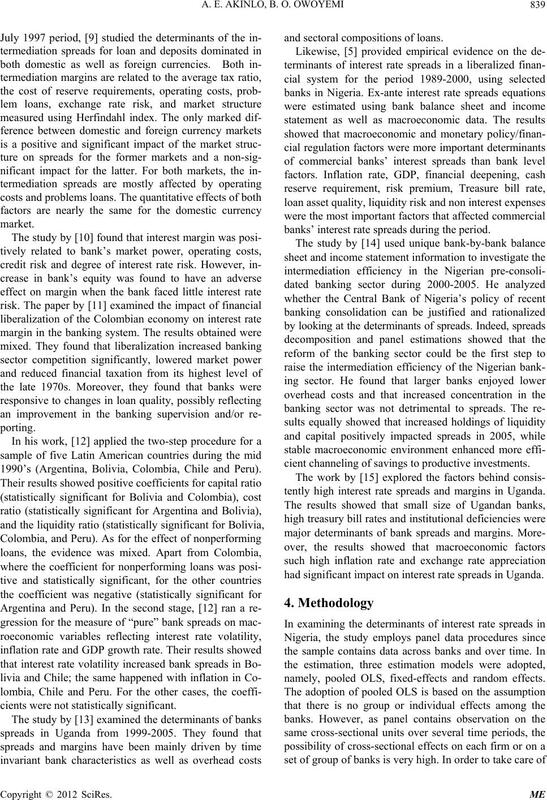 bean,” IMF Working Paper, WP/98/59. Banking and Finance, Vol. 21, No. 2, 1997, pp. 251-271. Economics, Vol. 88, pp. 192-204. Development Economics, Vol. 63, 2000, pp. 113-135. Research Working Paper 4267, 2007. Vol. 88, No. 2, 2009, pp. 192-204.
and Banking, Vol. 36, No. 3, pp. 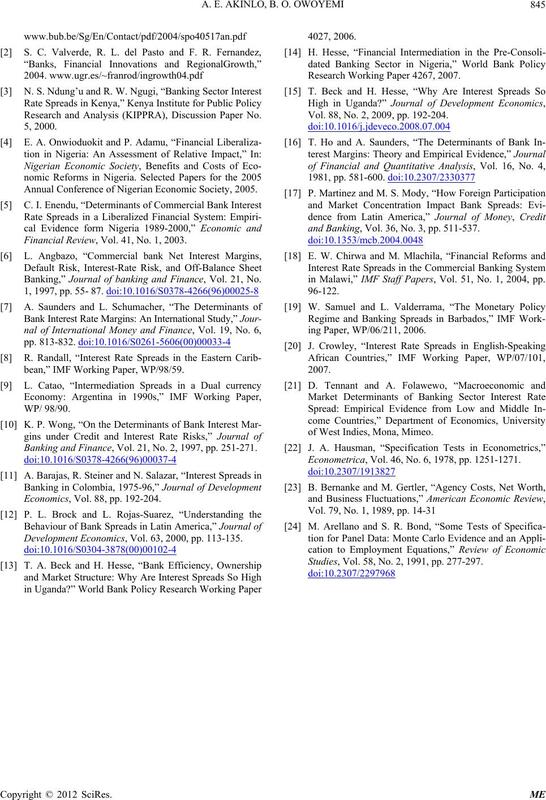 511-537.
in Malawi,” IMF Staff Papers, Vol. 51, No. 1, 2004, pp. of West Indies, Mona, Mimeo. Econometrica, Vol. 46, No. 6, 1978, pp. 1251-1271. Studies, Vol. 58, No. 2, 1991, pp. 277-297.